Barricaded and fenced. Accessibility denied. 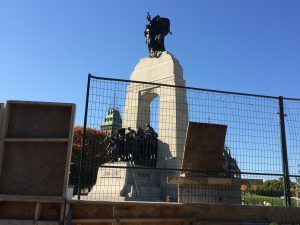 The National War Memorial in downtown Ottawa has been cordoned off from the public since April for ‘major restoration’. The work will be completed in time for the Remembrance Day ceremony on November 11th. I was sad not to be able to access this monument on my recent trip to Ottawa. Originally built to commemorate Canada’s sacrifice in World War I, it now honours all who have served our country in wartime – many of my relatives among them. My novel, The Medal, is my own tribute to one soldier in particular: my late father-in-law, on whom the character of Harry is based. How fortunate we were that he returned home safely. How blessed we are to live in a country of peace and freedom.